Those of you with vegetarian friends know the limited options vegetarians face in the restaurant scene. They are either stuck with the one entree on the menu that meets their dietary needs or forced to pick the salad. As a food lover myself, I feel as though the abundance of choices and delicious descriptions on page after page of a menu is half the adventure of dining out. With a thriving vegetarian population in Athens, GA, I have always wondered how they all survived on such limited options. Well, last Wednesday I tasted veggie heaven. My vegetarian friend was ecstatic that our dinner crew let her pick the restaurant for the night. While we had all heard raving reviews, none of the meat-eaters in the group had ever been to The Grit. Feeling adventurous in our last year in college, we were excited to try something new. Little did we know how much we would all actually love it. Surrounded by a relaxed, local vibe, the menu was endless. Noodle bowls, stir fry, falafel sandwiches, quesadillas, pita pizzas, loaded nachos - the list went on and on. After thinking long and hard about all of my options, I ordered the grilled cheese smelt, and I can guarantee you it was one of the best decisions of my day. 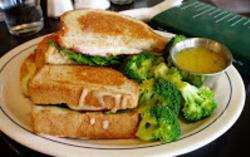 With chips and vegetables on the side, the fresh thick and well-buttered bread oozed with delectable cheddar cheese. I pulled the two sandwich halves apart only to discover a sliver of crisp spinach and a bright red tomato just waiting to be savored. My friends&apos; dishes filled the table with homemade macaroni and cheese, dusted with light brown bread crumbs and creamy golden cheese, a massive crunchy vegetable and cheese quesadilla, stuffed with flavorful peppers and onions, and a falafel pita, filled with chick pea fritters, veggies and lemon-tahini dressing. Needless to say, it didn&apos;t take any of us long to dig in and polish off the plate. The meal was refreshingly different than many of the Athens restaurants we have eaten at before, and the fresh ingredients and local touches left us with full stomachs and a new favorite restaurant. Of course Athens has an abundance of other restaurants that provide its vegetarian crowd with meat-less options. While most of them are not exclusively vegetarian, their menus offer selections for stricter diets. Clocked for example, a quaint but retro small burger and sandwich joint, has great vegetarian options including a humus sandwich, a hot falafel sandwich, and their juicy veggieburgers that taste just as good as the flavorful burgers they&apos;re known for. Local favorite Mama&apos;s Boy is also vegetarian-friendly and will easily prepare menu items without meat upon request. With a menu designed exclusively for its Athenian diners, the Athens&apos; Buffalo&apos;s Cafe location also provides vegetarian options that are unique to the franchise. An entire page of the menu is dedicated to garden burrito wraps, tortilla broccoli and penne pasta, spinach quesadillas, veggie fajitas, and so much more. While I may never be a vegetarian myself, its exciting to know that the amazing assortment of Athens restaurants takes care of its vegetarian residents and visitors. Do you have a favorite vegetarian spot to get your veggie fix? Let me know, so I can try it myself!